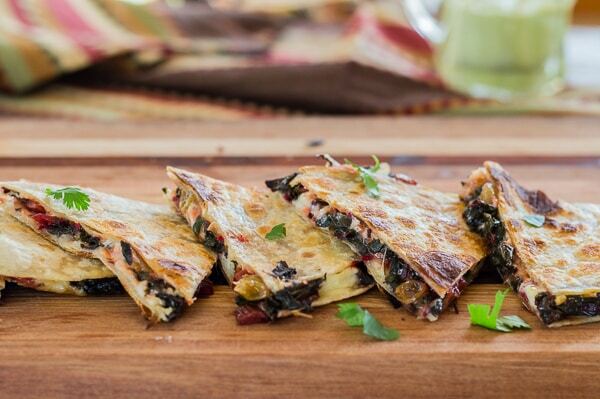 Chard and pepper jack quesadillas, loaded with tender-sautéed leafy chard and spicy pepper Jack cheese, surprise with a wild card ingredient, golden raisins! The raisins balance chard’s slight bitterness with a pop of fruity flavor for stellar quesadillas. Complete the picture with an easy creamy avocado and lime sauce. Wishing you a fabulous week–get in the kitchen and cook some celebratory Mexican food! 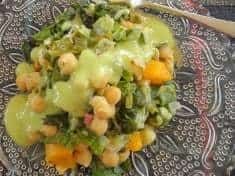 For more Mexican vegetarian recipe ideas, check out my Mexican Pinterest board. 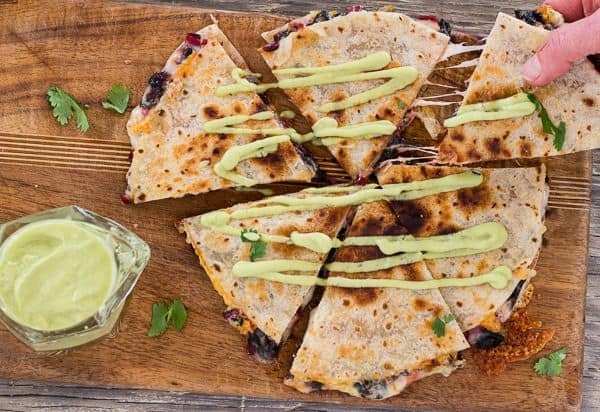 These easy to make quesadillas are filled with a delicious combination of flavors--tender vitamin-rich chard, spicy pepper cheese and a surprise ingredient--golden raisins. Heat the olive oil a medium skillet on medium flame. Add the chard stems and cook about 5 minutes. Stir in the garlic. Add the chard leaves and sprinkle with salt. Cover the pan and cook until the leaves are very soft, 6 to 8 minutes. Remove the cover and cook, stirring occasionally, until most of the extra liquid evaporates and the leaves have seriously shrunk. Splash the pan with the vinegar and season with salt to taste. Lightly brush one side of a tortilla with olive oil. Place oil side down in a skillet. Sprinkle evenly with a quarter of the cheese. 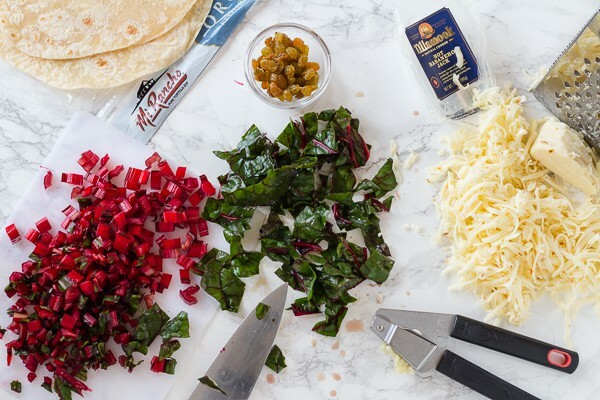 Scatter half of the chard over the cheese. 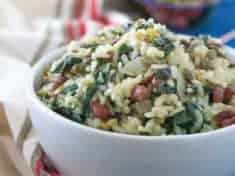 Drain the raisins, distribute half of them evenly over the cheese and chard. Sprinkle with another quarter of the. Top with a tortilla and brush lightly with olive oil. Cook until the bottoms are golden, 3 or 4 minutes. Gently press down the top with a spatula. 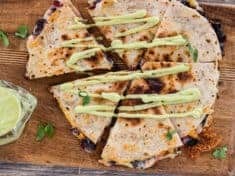 Gently flip the quesadilla over to brown the other side. Keep warm and repeat to make the second tortilla. (You can use 2 skillets and make both quesadillas at the same time. Transfer to a cutting board. Cut each tortilla into 8 wedges. 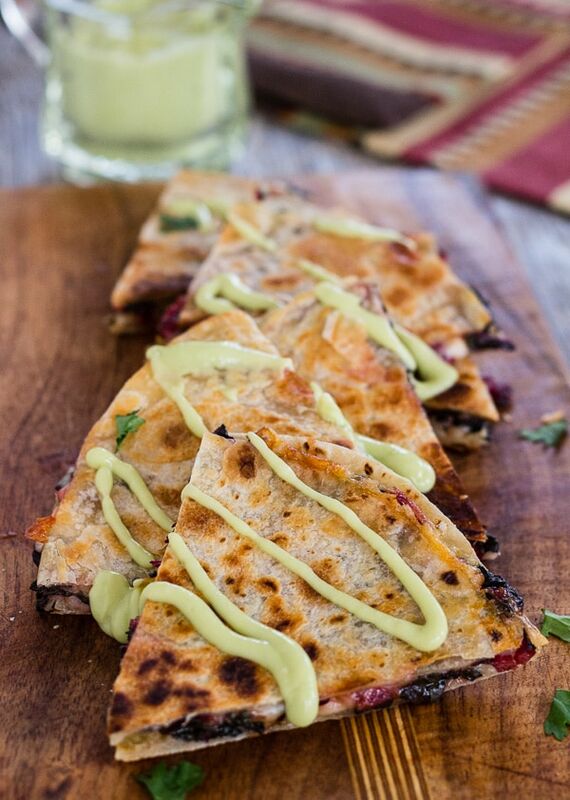 (If you let the quesadillas cool a few minutes they will be easier to cut. 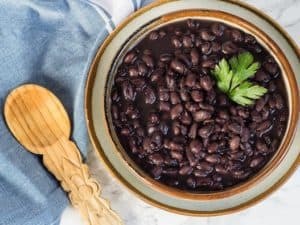 Serve with Avocado Crema or a favorite salsa. Make a point to read tortilla labels. 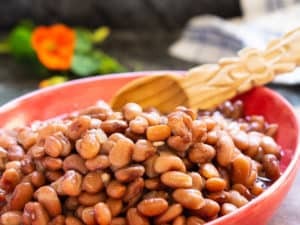 Many flour tortillas have a long list of questionable ingredients and there are better choices available in natural food stores. No hydrogenated fats, please. For gluten-free tortillas, sample several different brands to find the best one. Don't sub in dark raisins--they don't have the same subtle fruity flavor, plus their dark color is not pretty in the filling. Letty, these look absolutely yummy! We’re going to share this with our Twitter and Facebook fans on Tuesday, and link here so they can see how to make it.